What can you tease of the ultimate showdown between S.H.I.E.L.D. and Aida in the finale? HENSTRIDGE: Aida’s given everything to be human, and she’s gone through so much. She’s been treated, in her perspective, terribly. She was treated like a machine, she was locked in a cupboard, she wasn’t asked her opinion on anything, and so she’s traveled so far to get to this point of being human, she’s not going to let that go without a fight. She’s made it so that she’s very well equipped for any sort of battle that’s coming her way. So, for her, there’s everything at stake. Anton’s plane has found Daisy and Simmons. What can you tease? WHEDON: Well, he definitely comes back with a little bit more pep in his step. For a head in a bottle, he’s pretty dangerous. But you know, one of the things that Zach [McGowan] brings to the role is that he’s a little bit of a chameleon. He’s very physical and very good with all the action stunts, so we’re going to lead into that and let him do a little of that at the end, sort of cut his leash. He’s very good with the knives, very good with all that stuff, so he will be wielding them. So could there be a future for May and Coulson? And possible wedding bells for Fitz and Simmons? TANCHAROEN: There are always complications. Coming out of the Framework, the emotional toll is even more intense. WHEDON: Yeah, I think that’s the right question. We can’t really say, but we don’t really know. We don’t even know what’s going to happen in season 5. Just know that if you see a season 5, it’ll be by the seat of our pants. 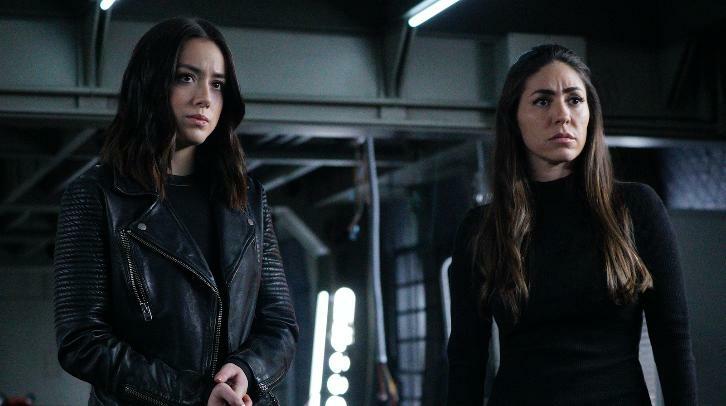 “The Return” – In the exciting penultimate episode leading into next week’s season finale, Coulson and the team’s victory in the Framework is short-lived, as an even deadlier enemy looms against them all, on “Marvel’s Agents of S.H.I.E.L.D.,” TUESDAY, MAY 9 (10:00-11:00 p.m. EDT), on The ABC Television Network. Guest starring are Natalia Cordova-Buckley as Elena “Yo-Yo” Rodriguez, Mallory Jansen as Aida, Adrian Pasdar as Brigadier General Glenn Talbot, Briana Venskus as Agent Piper, Maximilian Osinski as Agent Davis, Zach McGowan as The Superior, Ricardo Walker as Agent Prince, Brennan Feonix as Airman Whitley and J. Michael Evans as Airman Richardson. “The Return” was written by Maurissa Tancharoen & Jed Whedon and directed by Kevin Tancharoen.